There are a number of musicians and big actors in this movie. Tupac Shakur and Samuel L. Jackson, Queen Latifah and Doctor Dré have their appearances, some – as regular performers in the cast, others – as cameos. But it is wondering – why no one among listed ones sings for the soundtrack of this film? Instead, we have here Salt N Pepa and Cypress Hill. 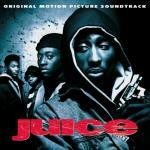 For example, Juice – the title theme – is executed by Eric B. & Rakim. Who the hell are those guys, you’d say? And you’ll will be fully correct – they aren’t too popular, if to put it mildly. But they do nice rap, with blotches of hip hop – interesting fusion, nice to hear once or twice. So You Want to be a Gangster is another title song, telling of regular things in the life of Afro-American population of the USA. Where cops are white and confronting with blacks just because these are two unkind races. Where black guys don’t work, but dressed in good-looking outfits. Where they conceive a baby but escape from the future mother of their child to make her carry this burden at her own. Where they so much don’t have a social responsibility that kill a person for nothing, when robbing his store. The entire lyrics of almost every song tell of hard life in ghetto, from where they originate. Or how kewl they are, despite the fact that all they do is not having a job & just wasting their lives for nothing. The bright thing to reveal the essence of what they truly want is Shoot 'Em Up, which lyrics and the name totally shouting. Reading it, you realize that some percentage of the population really doesn’t have nothing to bring to this world, except of hatred and wrath, as Cypress Hill correctly reveal in their song. Unfortunately, there is no data about the production budget of the film, but the box office is USD 20 million, which is pretty impressive for its theme.